If you look out the window of your Minneapolis, MN home, the wintery weather will immediately remind you that getting out on the lake with your boat is not going to happen anytime soon. Let’s face it, the winter months in Minnesota make it hard for boat lovers to enjoy the lake life. The only good thing about the winter time is that it is the perfect time to repair the windshield on your boat. If your boat windshield broke or cracked this past summer, it is important that you get it fixed as soon as possible. Count on the experienced boat repair professionals at Anchor Marine Repair to fix the windshield on your boat during the winter months. No job is too big or small for our staff as we can fix any tiny chips or cracks as well as provide a full windshield replacement. Experience is the number one requirement when we add on new staff. Every technician on staff has been with us for at least 10 years, bringing a combined boat repair experience of over forty five years. We are happy to work with insurance companies to keep more money in your pocket. With a 10,000 square foot facility, we are able to work on your boat windshield any time of the year. Another high priority for our staff is customer service. We take such pride in serving our customers that we offer a pickup and delivery service from your home or dock within a 250 mile radius of Minneapolis, MN. 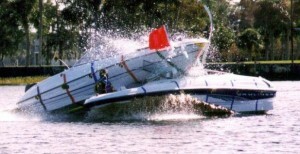 This is unheard of in the boat repair industry and is something that we take pride in! Take care of your boat so that it can stay around for the long haul! Having a properly functioning windshield is key because it is the first line of protection when riding out on the water. If you are in the Minneapolis, MN region, partner with Anchor Marine Repair for all of your boat’s windshield repair needs. Call us today at (763) 972-3540 to set up a free estimate or consultation.